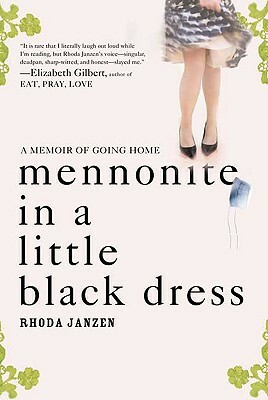 Michigan’s very own Rhoda Janzen will be at Borders in Birmingham for a reading and signing of Mennonite in a Little Black Dress on Wednesday, June 9, 2010 at 7:00 PM. The Hope College professor will present her humorous hit memoir which was recently released in paperback and has become a book club darling. Ms. Janzen was born in North Dakota where her father was the pastor of a small Mennonite church but has made Michigan her home for years. You can catch a few “quick facts” about Ms. Janzen by clicking here. Ms. Janzen currently teaches English and creative writing and has a previously published collection of poems titled Babel’s Stair. If you haven’t yet read Mennonite in a Little Black Dress, you can catch my NLR review Mennonites and Potheads? which I posted back in November. Rhoda Janzen’s next book is in the works and you can read more about her anticipated Backslider in my post Michigan’s Mennonite is at it Again. Our little Mennonite is at it again! Considering the success of Rhoda Janzen’s memoir Mennonite in a Little Black Dress, Henry Holt and Co. is banking on a repeat performance with Janzen’s follow-up Backslide. After strong reviews from the gate, Mennonite has been an unexpected success putting up impressive numbers for both the Hope College professor and her publisher. By definition, to backslide is to lapse morally or in the practice of religion; a fitting sequel title for those who have read Mennonite. According to PW’s Holt correspondent, Backslide picks up where Mennonite ends and follows Janzen’s journey back into the Pentecostal church and into “a tumultuous year which brings a new marriage, step motherhood and a bout of cancer.” The book is “about what happens when a backslider decides to slide back into religion.” Ms. Janzen’s sequel is slated to release in 2012. If you haven’t read Mennonite in a Little Black Dress, it is hilarious…and very smart. If you missed it the first time around, you can catch my review on NLR with the following link: Mennonites and Potheads. A few months ago, I read a hilarious essay in the The New York Times titled The Tractor Driver or the Pothead? I flagged it, passed it on to a few friends, and eventually forgot about it. When I found out the new memoir Mennonite in a Little Black Dress had Michigan roots, I immediately pursued a copy and realized upon its arrival that author (and Hope College professor) Rhoda Janzen was the very same author who had penned the aforementioned Pothead essay. Smiling, I knew I was in for an entertaining ride. If you google reviews of Mennonite in a Little Black Dress what you will find are words like hilarious, laugh out loud, funny, sparkling…and all of these are spot on. However, Janzen tempers the hilarity with her somber return home to her Mennonite roots in hopes of healing her broken body and spirit. We all have friends whose lives are so full of rich material we beg them to write a book, and in this case Ms. Janzen does just that. After her husband splits for a man he met on Gay.com and she suffers a horrid car accident, Janzen heads home to the land of bad food, clothes, and hairdos to try to piece together her damaged life. The return home for an adult can be a daunting journey, particularly when you have decidedly moved beyond the strict moral codes of your Mennonite faith, yet Janzen finds herself appreciating the very things she once despised as a child. Through her experienced eyes, she is able to see the beauty in her Mennonite community and take refuge in its straightforward tenets and simplistic approach…while laughing all the way. I sometimes ask my college students if they think it’s possible for a thirty-plus adult to experience saltatory ideological change. I tell them that I’m not talking about the kind of gradual mellowing that results from age. Nor do I mean the kind of abrupt character fissure that opens in the wake of trauma or suffering. Rather, I want to know what they think about the possibility of a profound, lasting change that emerges from an act of deliberated, conscious self-determination. I want to know if they think we can change our core assumptions about what we believe. About how we believe. Though such passages give pause, overall Mennonite in a Little Black Dress is terribly intelligent and damn funny. Added bonus: If you know nothing of the Mennonite community, this is the perfect “Menno 101” crash course that only the talented professor Rhoda Janzen can provide. Author Megan ShafferPosted on November 23, 2009 February 23, 2010 Categories Authors, Book Reviews, Mennonite in a Little Black Dress, Rhoda JanzenTags Book Reviews, Hope College, Megan Shaffer, memoir, Mennonite in a Little Black Dress, Michigan, Night Light Revue, Rhoda Janzen2 Comments on Mennonites and Potheads?